Older dogs who have lived and learned through the puppy and teenage years to become calm, consistent, and ready to give you all their love make the best companions. Now let’s consider yet a last scenario—with a different species. Dogs, past the irresistible puppyhood and wild teenage years but nowhere close to their golden ones, relinquished or abandoned at a shelter or rescue by their owners. Dogs repeatedly trotted out during adoption events, desperate for love, for a home, only to be overlooked time and again. Dogs contained behind kennel gates, only to be ignored by potential adoptees because they’re not wiggly, fuzzy puppies. Doesn’t it make your heart hurt to know that tender furry souls go without fulfilling their purpose of loving and protecting a person or family simply because they are no longer young? According to Petfinder’s data, only 75% of adult dogs on the site were likely to be adopted compared to 95%, 80%, and 68% for puppies, young dogs, and senior dogs, respectively. The percentage of dogs likely to be adopted drops according to breed size, as well. As this is a blog aimed at the German shepherd dog community, these stats frequently add up to sorrow for mature GSDs regardless of how good natured they may be. They need homes just as much as any other dog—and they deserve just as much of a chance at a happy life. You may even save its life. They aren’t “damaged goods” or even necessarily “problem” pups; people abandon and relinquish dogs all the time, and often simply due to changes in their own lifestyle. They are calmer and less energetic, making them better walking companions. Many times, mature dogs are already housebroken and even know basic commands—and learn tricks as easily as younger ones. They are perfect for those who are novice owners with neither the time nor the experience to raise a puppy properly. Mature dogs 5 years of age and older are especially great, as many breeds can have an extended adolescence that can be avoided by choosing a dog who is often overlooked. I loved my puppies and my teens like crazy, but what I was rewarded with when they entered adulthood is incomparable. A dog that knows you love him and has given you his full trust. A dog confident in her fur. A dog who is calm enough, and knows you well enough to offer you exactly what you need, when you need it. 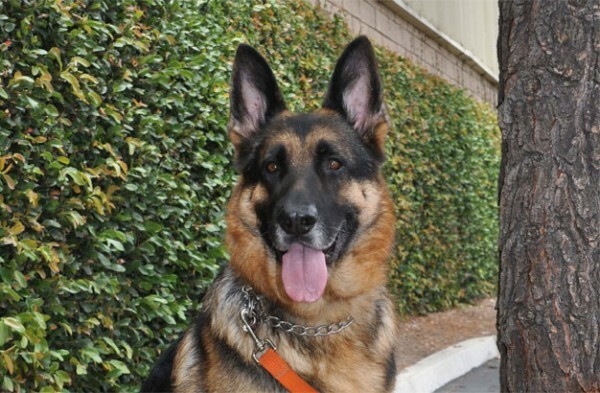 The next time you’re looking to rescue or adopt a GSD, don’t automatically overlook the many fabulous dogs over the age or 4 or 5. Give them a chance. Older dogs have so much to give and so much to offer—if you love dogs (especially GSDs), it would be your very sad loss to not have shared your life with one. It’s a companionship unlike any other.